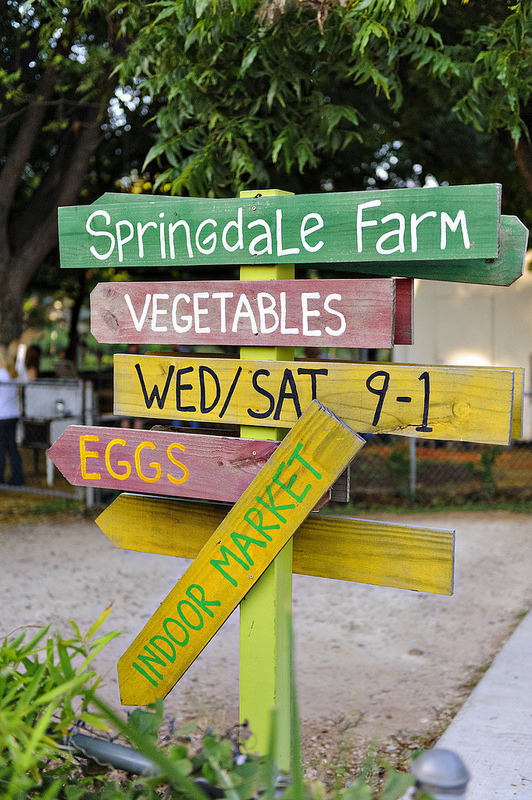 CreativeMornings/Austin celebrated June’s theme month on Food by hosting their event with speaker Sonya Coté at the beautiful outdoor venue, Eden East. 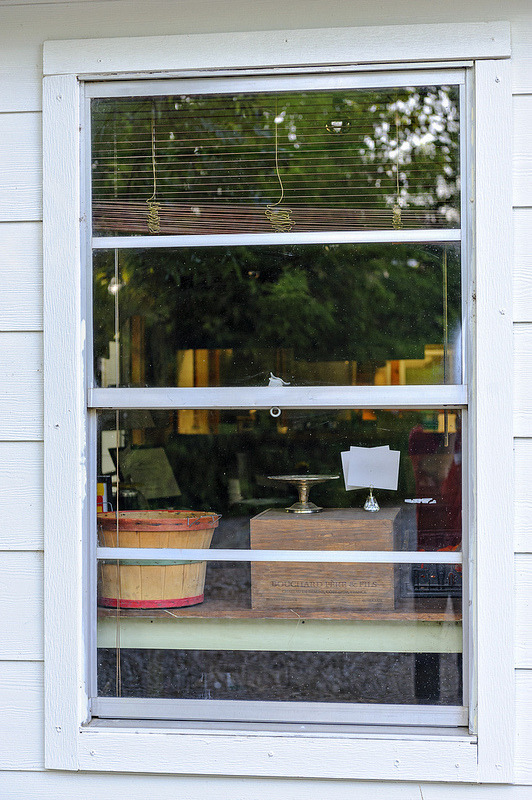 Photos by Marshall Wright. 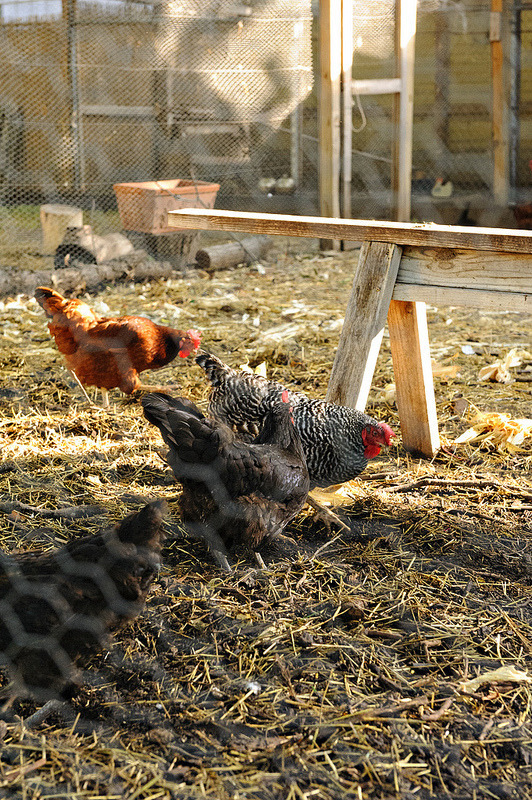 Check out the rest in their Flickr Album. 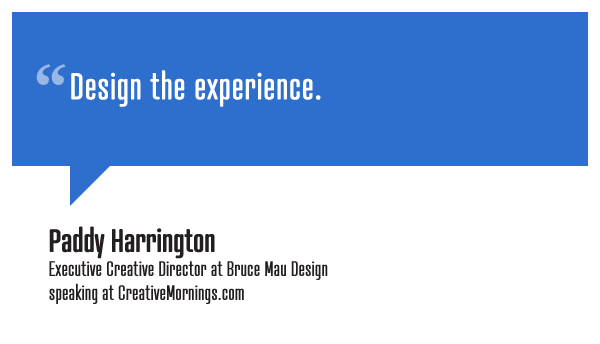 The Austin chapter of CreativeMornings is organized by Ben Thoma. 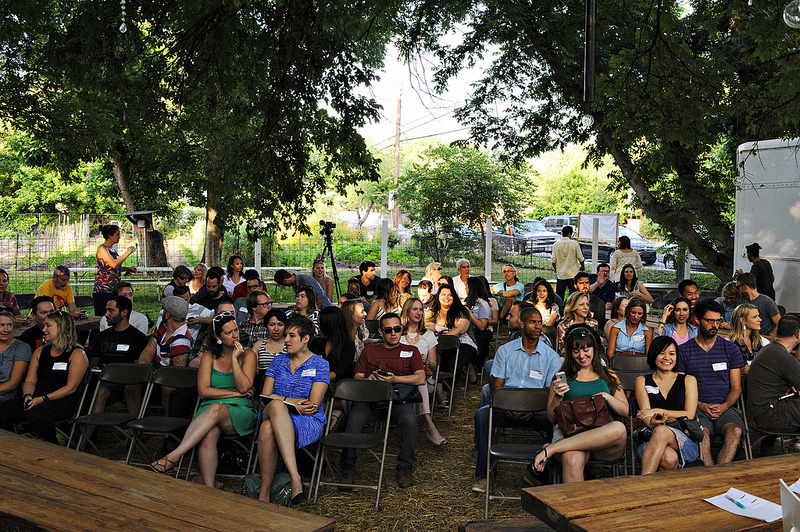 Follow along with them at @CM_Austin! We have an excellent summer party planned for you. 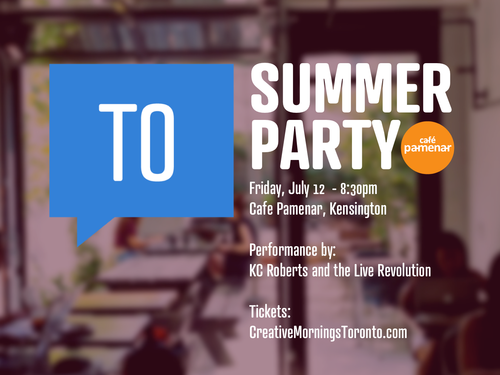 This Friday join us and the KC Roberts and Live Revolution band for an evening of mingling and drinking together. We are willing to bet you will all be even more chatty with booze in your hands. PLEASE MAKE SURE YOU REGISTER ONLINE AND EARLY. The space is limited and getting your ticket online is the best way to make sure you can get in. You might know Pamenar as the wonderful coffee shop in Kensington, but wait until you discover what it could be in the evenings. 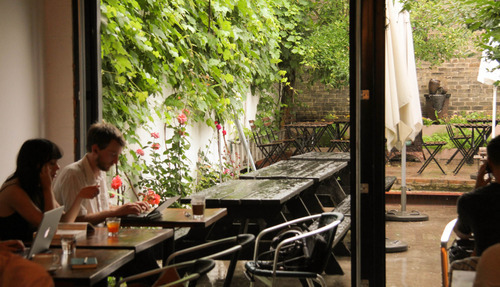 With the beautiful green patio in the back it is the place to be on a Friday night. We just made it easier for everyone to enjoy the night. No cover + cash bar. If you already got a paid ticket you will get a full refund unless you reply our update email telling us it is ok to put your money towards some munchies for everyone. Online registration opens at 9:00am on Monday June 24th. 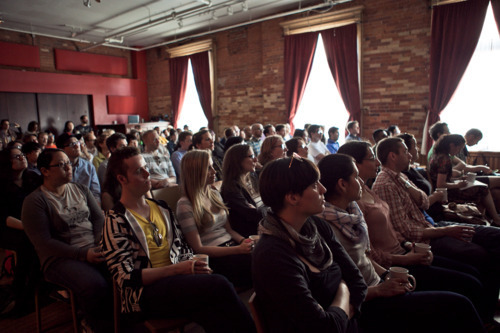 To receive registration reminders follow @Toronto_CM and subscribe to our email list. 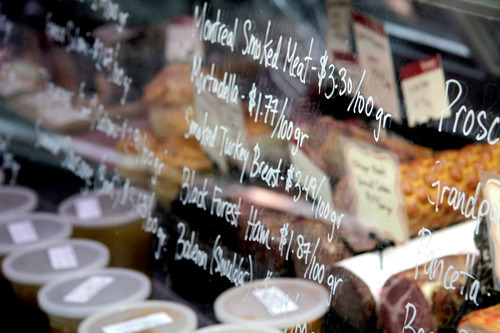 Peter Sanagan is not your usual butcher. A chef by training, he has lead the kitchens of some of Toronto’s top restaurants like Auberge du Pommier and Mistura for 15 years. 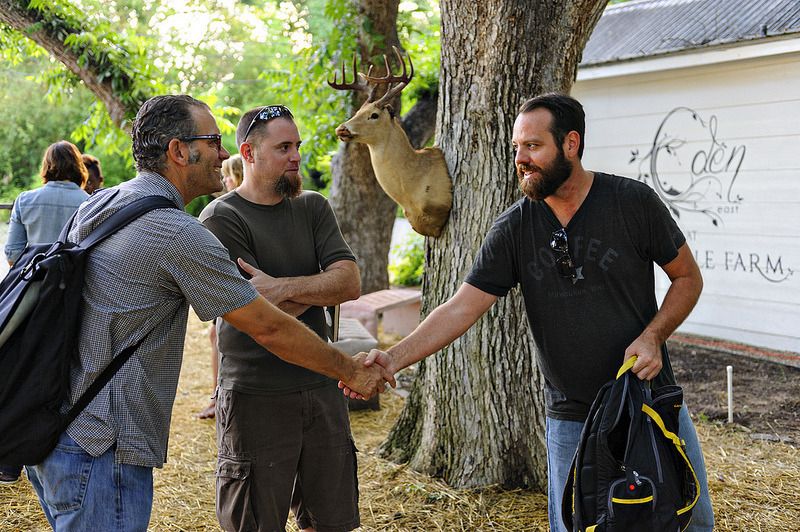 Peter is as aware of the image and profile of his business as the quality of the products he offers. After all a butcher shop with 3000+ twitter followers is an indication of something different going on. After his years of cooking in the city, equipped with enthusiasm and curiosity of his culinary explorations in Hong Kong in his younger years, Peter went north to Grey County and found himself fortunate to be cooking with exceptional local produce and meat. 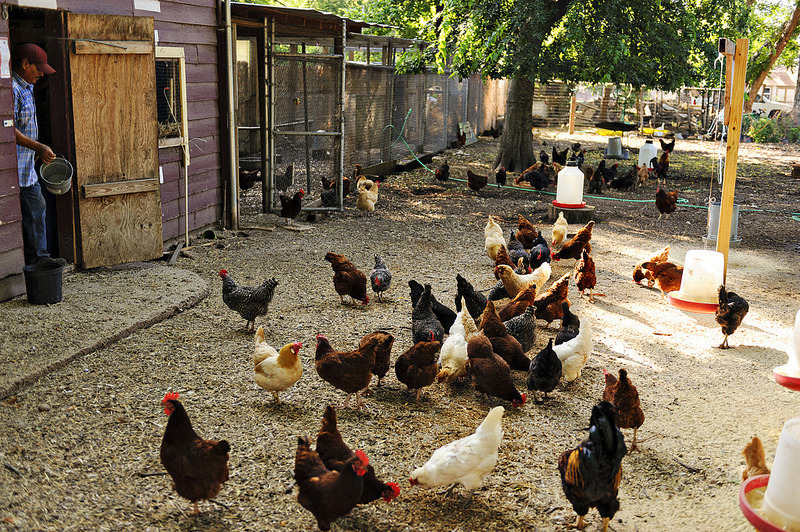 “I realized here that Toronto needed to discover the remarkable quality and variety of food produced by the small farmers who rarely have the means to get their goods into big city shops” he says. 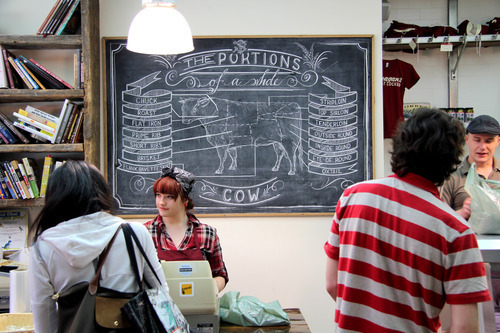 Everything fell into place when he stumbled upon a the For Sale sign of Max and Son butcher shop, a 50 year old store in Kensington Market. 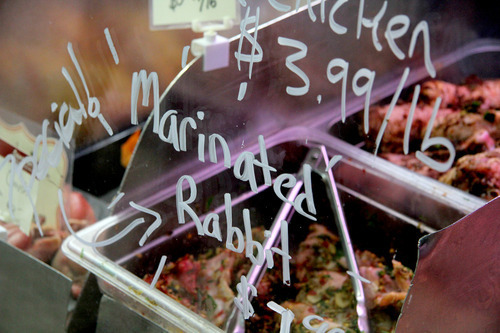 A week later Sanagan’s Meat Locker picked up where Solly Stern has left off and the rest is lamb chop history. Swipe is an independent store with a selection of contemporary books on graphic design, advertising, architecture and urbanism worthy of space on the most enlightened of shelves. 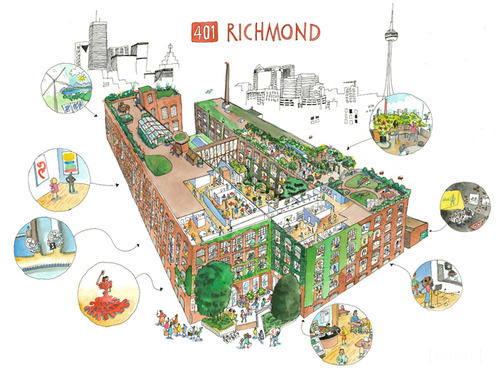 401 Richmond is a restored, heritage-designated, industrial building in downtown Toronto that is home to over 140 artists, cultural producers, microenterprises, galleries, festivals, and shops. Hello Toronto friends. We are taking a little break this month as schedules of our speakers (and the back up speakers) had to change unexpectedly. In the meantime we will be releasing videos of some of the most popular lectures of the past few months starting with this thoughtful presentation by Underline Studio. We are really excited with our 2013 lineup of speakers and have some special events and treats planned for you along the way. Keep in touch on Facebook, Twitter and via the email list (right here on the left column). Enjoy the talk and send us your speaker nominations on facebook! Zahra Ebrahim is the Founder and Principal of the design think tank and creative agency, archiTEXT. Born in Kenya, raised in Vancouver, and educated at McGill University in Montreal, she started archiTEXT at 22 years old as a place to bring together diverse groups to tackle the intersections of architecture and design with social change, to explore the impact of design and creativity on systems change, and to engage the public in a discourse of design and design thinking as a mechanism for creative problem solving. At 24, Zahra was invited to teach at the Ontario College of Art and Design (OCAD) in the Think Tank program, getting the next generation of designers asking complex questions of themselves and the world around them. Zahra spent two years serving as Innovator in Residence at Canada’s National Design Museum, the Design Exchange. In recent years she has become increasingly committed to exploring the space where design, creativity, and play engage with systems change, sparking initiatives that create conversation and activate innovation. Her work has been featured in Luminato, Come Up To My Room, Nuit Blanche, Toronto Design Offsite, TEDxTalks, as well as on CBC, The Globe and Mail, and the Toronto Star. She has been the recipient of several innovation and entrepreneurship awards internationally, most recently as one of the Global Knowledge Partnership’s Top 100 Young Global Social Entrepreneurs. More than a hotel,The Gladstone is a social and cultural incubator facilitating sustainable and accessible ways of experiencing art, culture, community, and local cuisine. We host over 100 arts-related events each and every month! 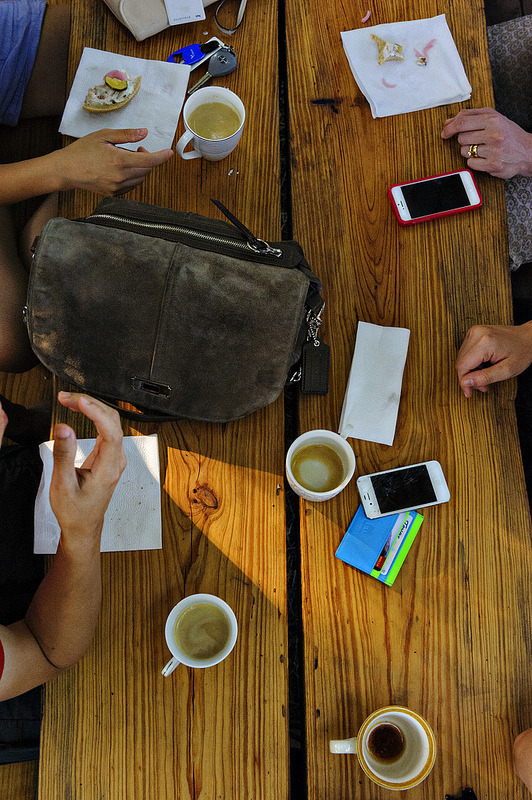 Konrad Group is a leader in cutting edge mobile, web, and social application development. As an integrated team of specialists, they provide strategy, architecture, design, and development for some of the greatest brands and agencies in the world. This event is free. Online registration starts on Monday March 11 at 9:00am. 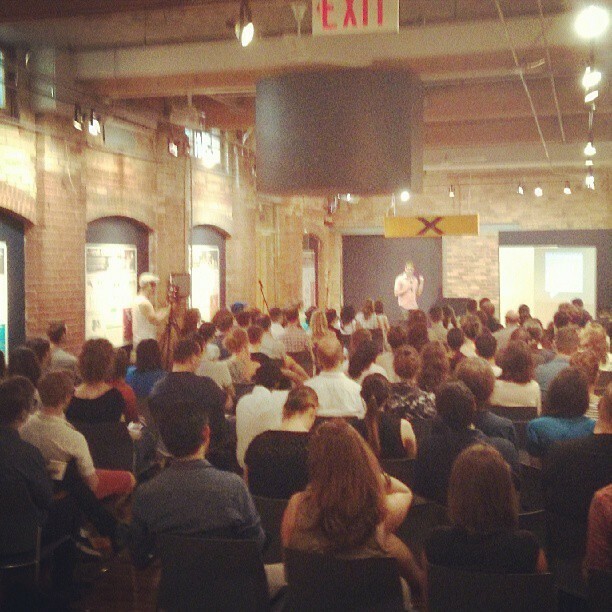 To receive a reminder follow @Toronto_CM and subscribe to our email list on the left. Spencer Wynn is currently the Deputy Art Director for the Toronto Star newspaper and has more than 28 years of editorial and corporate design experience. He has been recognized nationally and internationally with awards of excellence in news, corporate and magazine design. He is called upon to lecture and evaluate graduating student work for colleges and high schools. In addition to design, Spencer has traveled extensively on assignment to shoot and write for the Star and a variety of freelance clients. He has been published in the Toronto Star, various travel sites and blogs, and the New York Times. Spencer’s many visual interests and skill-sets contribute seamlessly into his design work and his sensibility as one of Canada’s leading designers. 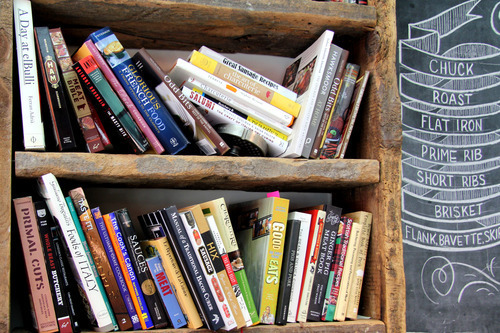 Blurb is a company and a community that believes passionately in the joy of books – reading them, making them, sharing them, and selling them. We’re photographers, designers, and book-lovers too – obsessed with quality and sticklers about top-notch binding, gorgeous paper, and professional printing. In a nutshell, Vitamin T was created to exclusively meet the unique needs of ad agencies, mid-sized companies and digital creatives. 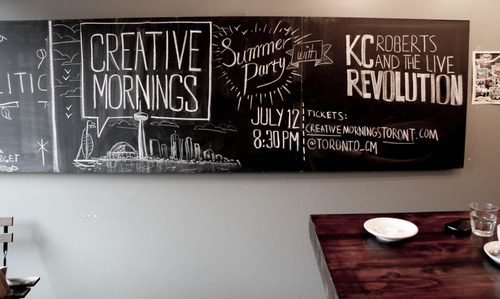 We spend our time connecting the best creatives in the industry and we’d love to connect with you at the Creative Mornings event! Nora Young is the host and the creator of Spark, CBC Radio’s national radio show and podcast about technology and culture. In this eloquent lecture she explores topics of virtual self, privacy, cyber activism and open data. Get to know one of our February speakers better. Steve Frykholm, Creative Director and Vice President at Herman Miller.